Enjoy the magnificence and significance of Central Park on this one-of-a-kind sunset walk, where you’ll visit 27 different areas in Central Park (don’t worry, breaks are included) and amass a crazy amount of trivia. 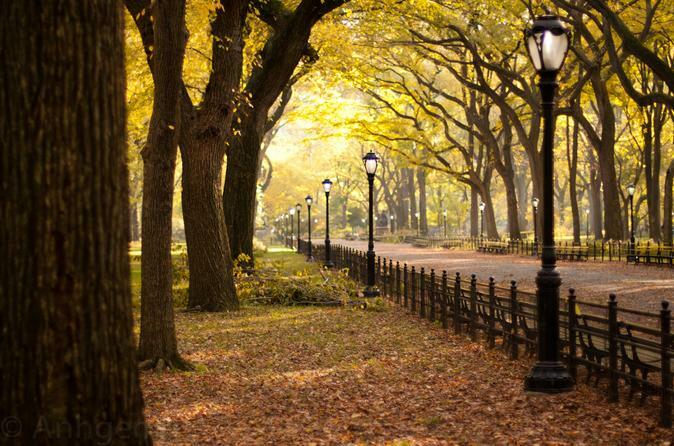 Discover the hidden secrets of Central Park on this spectacular sunset walk. Along the way you'll discover where television shows and films were shot, uncover stunning architecture, experience the sunset in a romantic rock garden and come away with a new appreciation of the history of the park and its significance to New York City. Whether it's your first time in the park or your thousandth, you'll walk away with a new perspective and the ability to dazzle your friends with fun factoids. Your tour will cover the most frequented area of the park from 59th Street to 72nd Street and the lesser frequented area from 72nd Street to 81st Street. It covers the history of the men who built Central Park and the men who later used Central Park for their own political gain, a plethora of architectural styles, and popular movie locations. The Central Park Zoo: One of the countries earliest zoos still delights visitors to this day. Bow Bridge: Overlooking the lake, it's arguably the park's most romantic bridge, featured heavily in film and television. The Great Lawn: Home of various concerts over the years by artists such as Diana Ross and Simon and Garfunkel. The Ramble: Central Park's wild woods is full of twisting paths, waterfalls, and a plethora of birds. Strawberry Fields: Central Park's Tribute to John Lennon. The Mall: Central Park's elegant Elm-lined promenade.